It’s my favorite day: reveal day! If you’re just popping in, let me give you a very brief rundown on what’s going on. Two years ago, I started a series called the $100 Room Challenge. The gist: you get one month, and $100, to completely transform one room in your home. 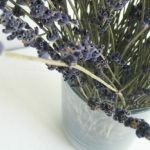 In January of this year, others started joining in, so make sure to check out all the rooms that have been made over this month by going to the end of this post. Even those that don’t have a blog are joining in on Instagram, so be sure to use the hashtag #100roomchallenge so we can follow your progress. It was so much brighter with the lighter paint on the walls. 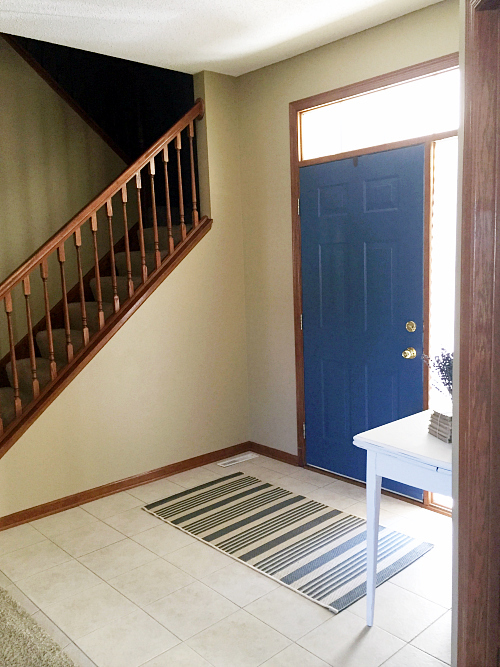 I also painted the entry table white and the door blue, for a little added color. 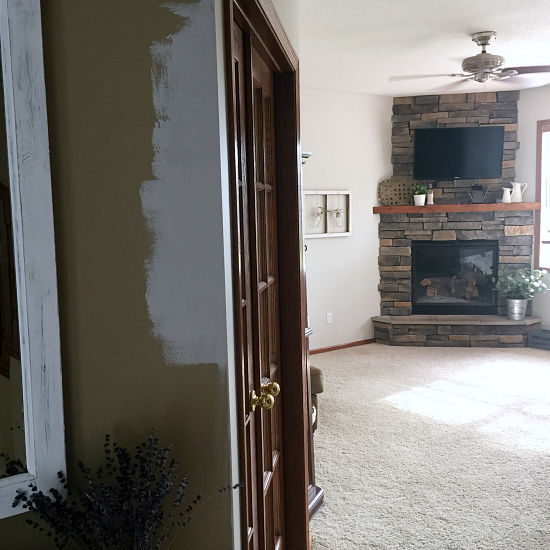 Fast forward to the beginning of this month… In July, we redid our living room (again, for the $100 Room Challenge), and one of the things we did was paint. 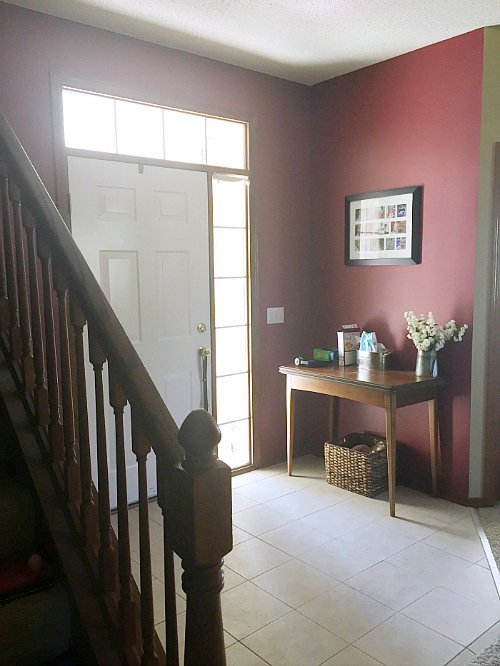 However, the light gray living room clashed with the beige entry, so I decided to take on the entry again… and here it is today! 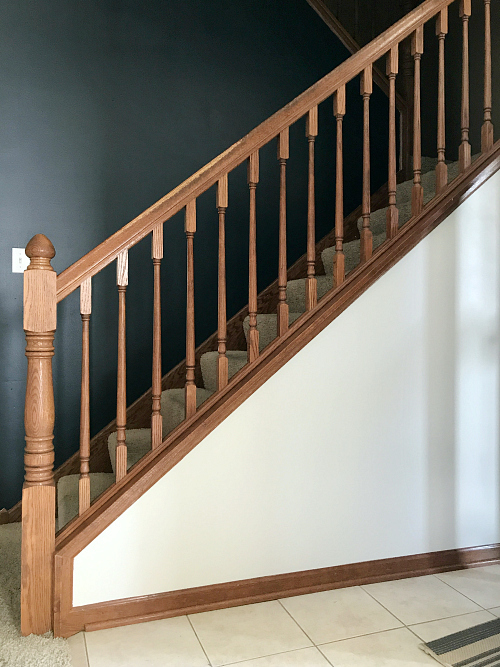 Not only did I want to get these two rooms to work together, I also wanted to add a navy accent wall. 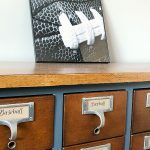 That navy wall was looking a little plain, so last week, I shared how I made these 16×20″ prints for less than $10 each. 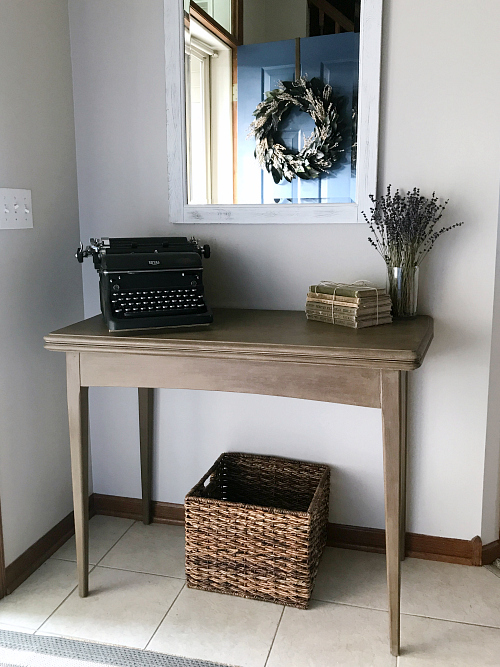 While the white table was definitely an upgrade from the previous dark (really worn) wood table, the white was getting too dingy with my kids placing everything from dirty shoes to muddy footballs on top of it, so I decided to create a weathered wood look using paint… check out week 2 for details. I was able to get only one of these things checked off: dog stuff has a designated spot. 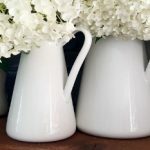 I love these rustic farmhouse hooks. I simply screwed them into a piece of wood I painted, and they provided the perfect spot for his leash and treats. 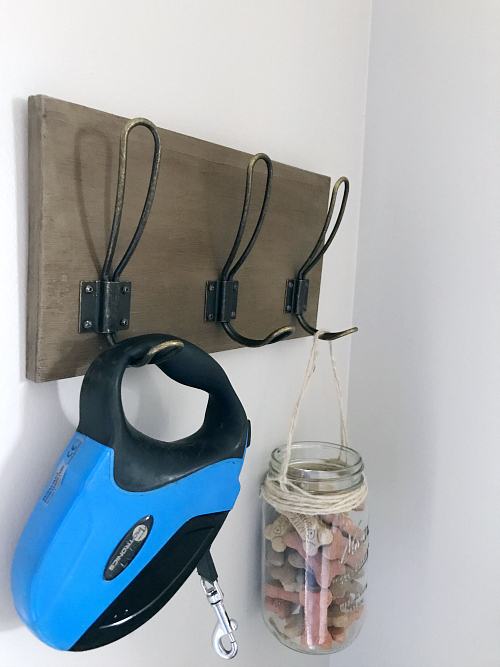 This project gave me a little trouble as the screws that came with the hooks were too long… so, I had to buy shorter screws and spray paint them to match the hooks. Luckily I had a spray paint that matched beautifully. (I would never guess those screws didn’t come with the hooks). I had also thought to put a little paw print on it (or something), but then realized this would be a great spot to hang umbrellas, or other little things, so I decided against it. Shoe storage did not happen. I thought long and hard about how to get shoes off the floor so our dog wouldn’t continue to use them as chew toys, but I just couldn’t figure out a solution that worked in this space, so for now, we’ll use the basket under the table and hope for the best. The old books on the entry table are actually my grandfather, and great-grandfather’s, reading books from school. One even has my great-grandfather’s handwriting, with his name and date (1893) written in it. Priceless. Total Spent on the Entry= $59.41!!! Not bad coming in $40.59 under budget! 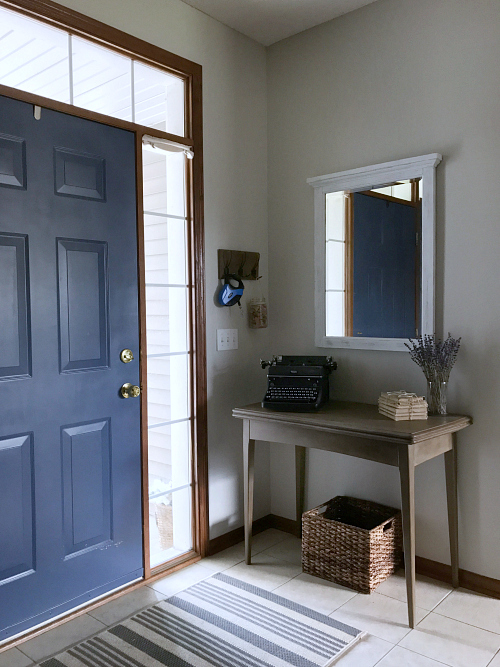 Make sure to check out all the rooms that were made over with a $100 budget by scrolling down to the end of this post… What people can do with $100 is utterly ah-mazing! What a great space you made. Clean, cheery, and what a change. Love it.. You do wonderful work, on such a small budget.. I am so glad you decided to join us! I absolutely love the power of paint. It changes things so dramatically without having to spend much money. 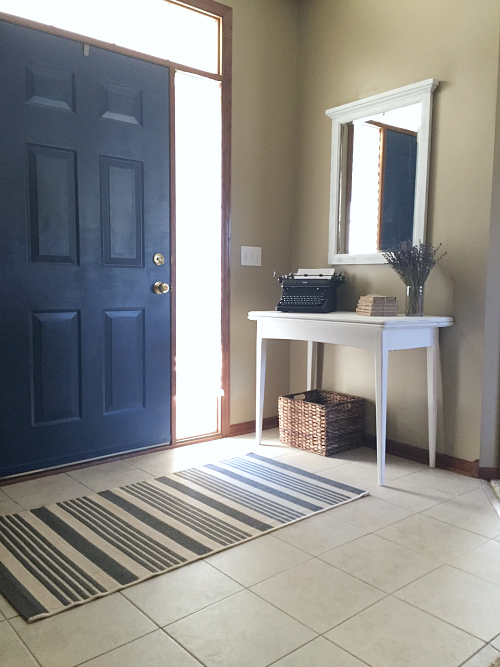 Yoyr entry way is beautiful Erin! This looks so great! It’s amazing what a little paint can do! LOVE paint! (Not to be confused with “love paintING”, ’cause I don’t love painting 🙂 ). 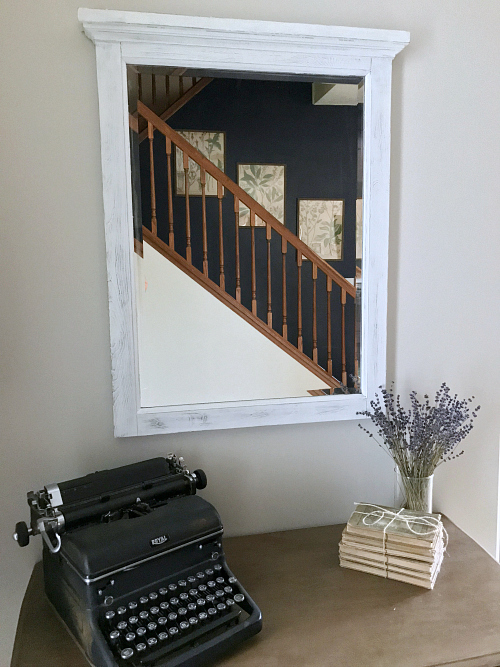 It’s such a great way to change a space for cheap! Totally agree with that statement. Erin, everything looks super good! Love your grandfather’s books. A treasure! And the typewriter! 20$? Why can’t I find cool things like that! Lol Thanks again for this challenge! 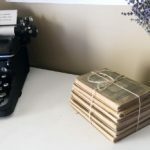 That typewriter was a steal for sure… I had found one and the tag on it actually said, “crappy old typewriter” and it had a bird’s nest inside. They were selling it for, like, $30. No thanks. This one comes along for $20 and I’m sold. Looks Great Erin. 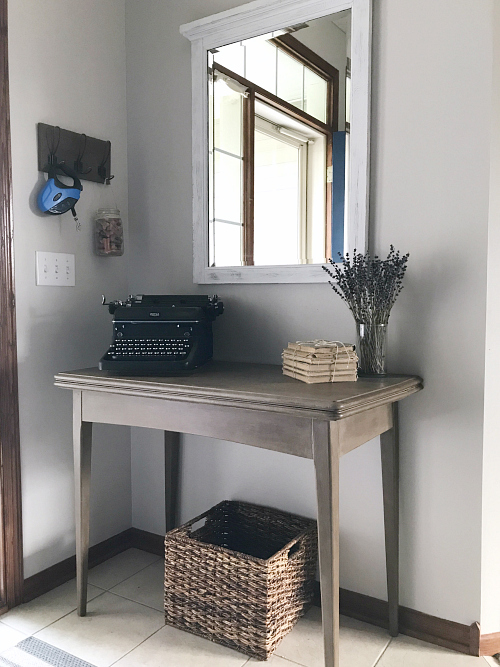 You are such a pro at this, you may need to do the $50 room challenge next 🙂 Love the blue paint, the table, and the tyoewriter !! Thanks for hosting this amazing event, I had so much fun!!! If I manage to find my new home by the next one, I’m in!! Wow! $50 would be tough. Maybe in a closet 🙂 I am so happy you participated this round. Always so fun and exciting to see what everyone decides to do! I love the color scheme! 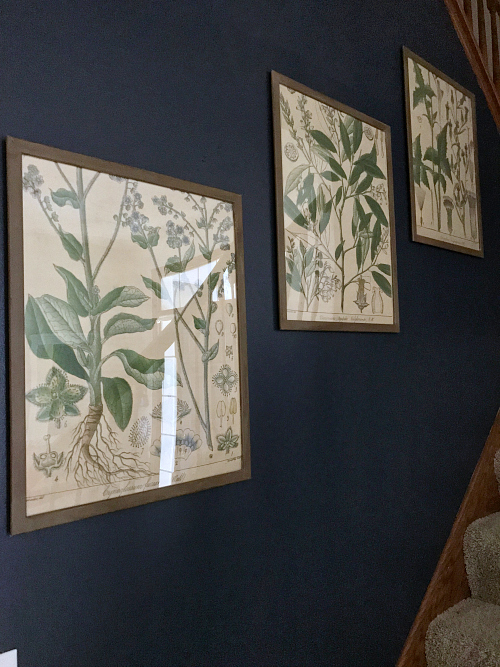 That navy wall just makes me want to swoon. Great job Erin! Thanks Keri! 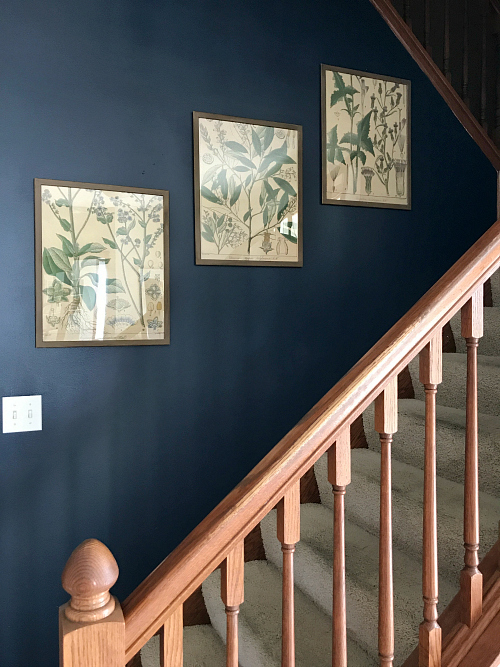 I am so glad I decided to go with that navy wall! I love the colors that you chose for this space. I also love that you showed that you can redecorate a space kind of often without spending a ton of $! I love what you did to this entry! 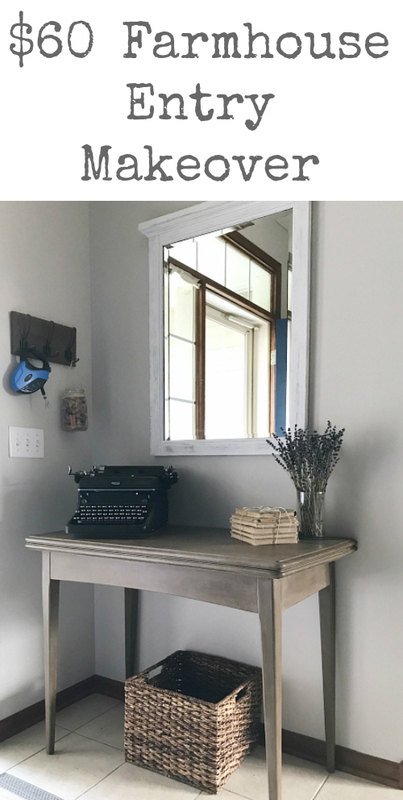 The paint alone made such a difference but i love how you styled the space – it’s perfect! I love that table! You did a great job and for so little money! Thank you for doing this challenge. I had so much fun! I love every detail of this space! 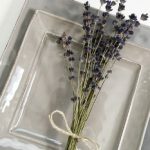 The colors are so fresh and inviting, the storage is great, and the accessories look beautiful. Well done, especially for under $60! Thank you so much Meredith! Always nice to have a space with a fresh coat of paint. This turned out great. Love the Navy! That turned out fantastic!! Love the Navy!! $40 under budget and it looks phenomenal!! 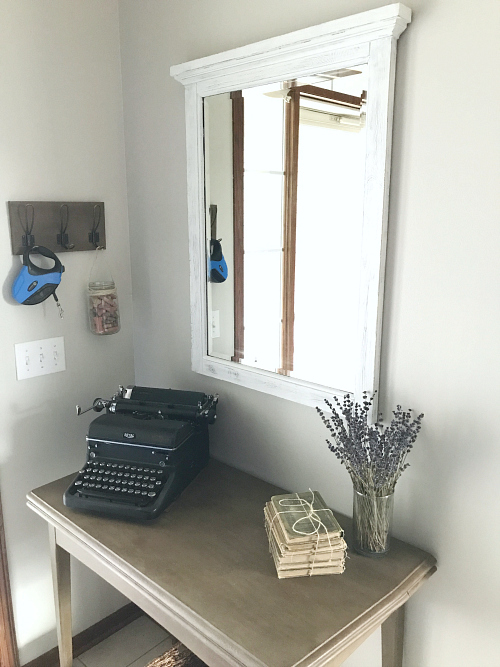 And that typewriter was an amazing score and looks perfect on your table. 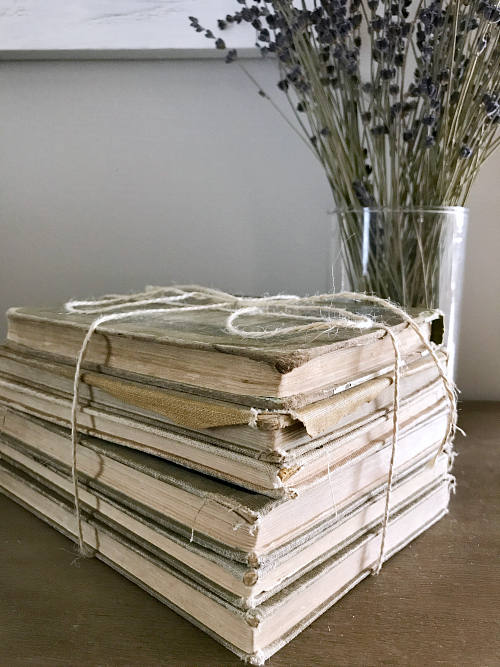 I love the idea of having family treasures like your books sitting there too. Great job! Everything turned out perfect! It looks fantastic! The colors are gorgeous and the wood finiah on the table really brings it all together! Thanks Lindsay! I love that wood tones do so well to warm up a space. This is gorgeous!!! I love that dark wall. It looks amazing. Thanks Jessica! I was a little nervous about going so dark with the navy, but I think it turned out to be a pretty good decision. I love how it turned out, Erin! That table looks amazing against the new wall color! And I love your hooks! Everything looks so nice and flows so nice with your living room make over. Beautiful! I love that typewriter! Thanks Liz! 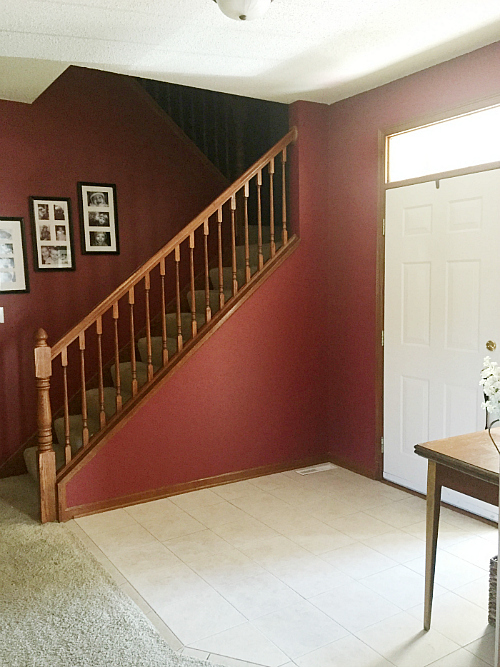 I am so glad I painted that living room, which meant it was necessary to also do the entry. I am much more of a gray tone person than beige, so the entire space fits me much better. I love it all!! Great job, Erin!!! And thank you so much for hosting this challenge!! I am SO glad I found your page!! Now, when is the next challenge?! haha! I am so glad you found the challenge too! Next one’s in January and I’d LOVE to have you join again! 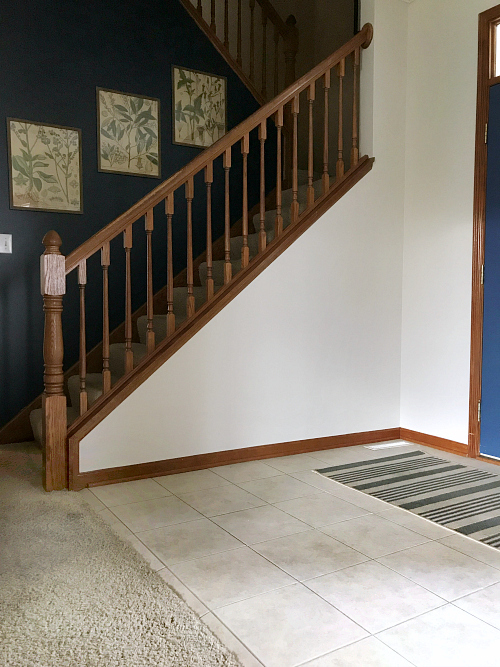 Your entry way looks great!! I always choose a basket for shoes too!! LOVE how the navy turned out! Seriously am itching to paint something velvety navy somewhere. It looks great! 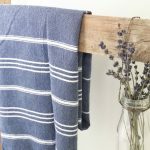 I have seen so many people do something with navy and it turns out so well every time. Decided I better get on board. Love the navy wall and the new hooks. And it’s so cool that those were your family’s old books! 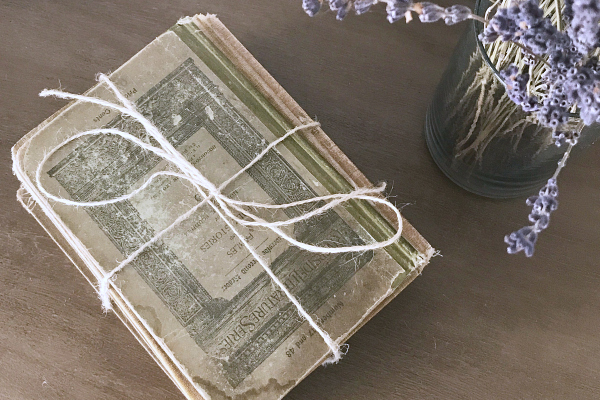 I little family history seems like just the touch you need to personalize a space. So happy to have you join the challenge again. Your living room turned out beautifully!